astrology | QuantumPhoenix.net – Esoterica, Paganism & Ritual Magic. Another major astrology news..very excited to tell you that 31st January 2018 happens to be a Blue moon (2nd full moon in same calendar month) AND also a total Solar Eclipse in the sign of Leo. More details & analysis/ forecasts will be added here in this same blog post so come back and check in a few weeks. ps. the second Blue moon in 2018 occurs on 31st March 2018. More on that and eclipses soon. Please do share this news so magicians & ritualists can take full stellar advantage of this. 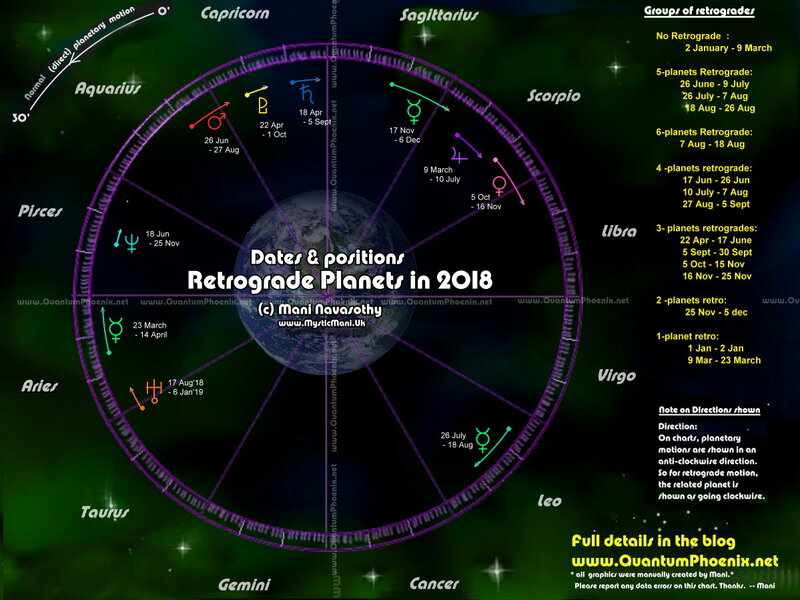 Dear all, some staggering news – In 2018, there will be a phase during which no less than 6 planets will be in retrograde motion! Yikes. That’s going to be one intense period (7th -18th August 2018). Of course there are many other 5-planets / 4 planets retrograde periods also taking place. As in years before, I have created an extensive infograpics ! (took me 3 hrs doing this manually working out data and creating the graphics! So please ..if you share this, kindly give my blog http://www.QuantumPhoenix.net a mention / credit). And come back to THIS blog post, as I add more details & analysis of the retrograde motions/ dates/ forecasts. Astro-Alert for next few days!!! We have a number of squares taking place..and it may prove to be initially stressful..So just hold it together. Squares generally create energies and influences that can only be resolved by taking action, rather than holding it in. Here’s a quick note on these. 1. Mercury in Libra -squares- Pluto in Capricorn (affects Gemini, Libra, Scorpio, Capricorn). 2. Sun in Libra-squares-Pluto in Capricorn (affects Leo, Libra, Scorpio, Capricorn). 3. Mars in Virgo- squares-Saturn in Sagittarius (affects Aries, Virgo, Capricorn, sagittarius). Although these zodiac signs are directly affected.. (because that’s where the planet is currently transiting through or those are the signs that are ruled by said planets), generally everyone is influenced by any aspects.. First rule of *astrology – everyone is influenced. -Saturn gives us hard lessons, governs long term stability, authority issues, shadows, fears, limitations. *(ps. am not entering into debates here about if astrology is real or not.. That’s for you to decide..and discus elsewhere. I write these for those who belief and follow it..and can do with some advance notice). Yesterday, retrograding Saturn went DIRECT in Sagittarius. No doubt Capricorns (ruled by Saturn) and Sagittarians (where Saturn is transiting now) will be very relieved to hear it. After all it’s been going on since early Apri’17. This saturn-direct is a very good news indeed for all ..and especially for those 2 signs. If you’ve felt held in place and as if your nose was rubbed against matters you rather not have given attention to.. and learn what needs learning.. you’ll now feel released to forge ahead forward with inner strength and stability gained over last 4-5 months. This evening Sun conjuncts retrograde-Mercury (in Virgo) – which might be a sharpness of the mind and welcome relief under the otherwise mercury-retrograde period – a case of mind & self being as one. Tomorrow there’s a very good Jupiter-Sextile-Saturn taking place – powers of widening horizons bending with long term stabilising influences of Saturn (added factor of Saturn actually being in the sign of Sagittarius which is ruled by Jupiter). All in all.. it’s gotta be a good few days..after the recent disruptions..especially of the venus-squaring-with Uranus disruption that probably clouded everyone on all day Thursday?! Now is a good time to catch up on roads not taken..and checking or laying foundations…for better futures. be brave…make those decisions you are stalling on.. and take those steps…! !